On Sunday afternoon Simba will go head-to-head with Yanga in what is being billed as a title decider. A win for Simba, who are ahead of Yanga by 11 points, would all but guarantee their first title in six years while a win for Yanga could, assuming Yanga also win their two games in hand, cut the lead to two points. A lot has changed since the 1-1 draw between the rivals back in October. Yanga have slowly but surely become stale, with the red-hot form of Ibrahim Ajib diminishing to a lukewarm one. Simba, however, have become lionised since the turn of the year. There is now an identity and smoothness in their play thanks to a change in formation which suits the profile of their deep squad. Increasingly pragmatic football coupled with an embarrassing Mapinduzi Cup campaign in Zanzibar saw Cameroonian coach Joseph Omog given his marching orders just in time to spend Christmas at home. Omog left the team unbeaten in the league and his successor Pierre Lechantre has maintained that record. A win on Sunday afternoon would all but secure the first league title in four years. The departure of Omog saw the task-master caretaker, and now assistant coach, Masoud Djuma Irambona do some renovation work as the Simba hierarchy sought a new coach. Out went 4-4-2 and in came 3-5-2, and Lechantre saw no reason to dismantle Irambona’s ideas once he was in situ, opting just to rotate the personnel to get the right blend. The energy of Shiza Kichuya and Shomari Kapombe and the maelstrom of Jonas Mkude came to form the core of midfield in front of a defence that was already water-tight. With concrete-solidity, calmness and creativity pushing them on, the goals of top scorers Emmanuel Okwi and captain John Bocco, plus the unending contributions of Kichuya, have resulted in the inevitable and in an irresistible – and so far unbeaten – side that was unlucky to bow out of the CAF Confederation Cup to Al Masry on away goals. Whereas Simba have played with a champions-in-waiting swagger, Young Africans have been soldiering on with a dogged, winning-ugly mentality. The aura they have as defending champions has dissipated – they certainly appear more vulnerable than the last meeting in October – but they have kept the points tally ticking. Football is a results business, after all, and, given the issues on the pitch and off it, the green side of Dar es Salaam have made the best of their situation. Despite parting ways with coach George Lwandamina, and the absence of the zen-like presence of Thabani Kamusoko in midfield and the goals of Ngoma and Amissi Tambwe, three of the best foreign players in Tanzania in recent years, for large parts of the season Yanga are remarkably within touching distance. They have not used their injury-ravaged squad as an excuse for the lowering of performance, commendably qualifying for the group stages of the CAF Confederation Cup. This game represents Mwinyi Zahera’s first as a coach. The former DR Congo assistant coach was unveiled to little fanfare this week but this represents a prime opportunity for him to make an immediate impact. The left footer has scored 3 derby goals in the last 3 meetings, quickly endearing himself to Simba fans after his transfer from Mtibwa Sugar. 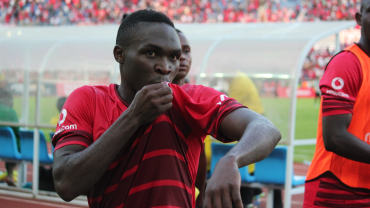 Aged just 21, ‘The Prince’ has shifted slightly central from the wing in Simba’s 3-5-2. The role has showcased the full range of his weaponry, particularly his eye for a pass and turnovers in the opposition half. The quality of his crosses inevitably locate the head of the tall Bocco who usually makes no mistake. The Zambian has come of age in Tanzania this season and relished the role of leading the line after the long-term absence of Donald Ngoma. Not only has he been a regular goal-getter but his link-up play has created opportunities for those behind him to join him on the scoresheet and also meant he could play fluidly in Yanga’s attack. Yanga’s fear is now holding onto the striker after the departure of Lwandamna, a fellow Zambian who brought him to Tanznania, but as long as Chirwa is on the pitch you can never doubt his effort or quality.